The winners of the 4th FIDE Grand Prix tournament were celebrated in the Music Theatre of the capital of Kabardino-Balkaria. The chief arbiter Vyacheslav Namruev announced the official results of the tournaments. 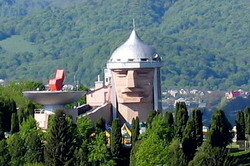 He pointed out that the 14 chess players of the 20 strongest grandmasters of the world gathered in Nalchik. The events of this round of the FIDE Grand Prix were watched in many countries of the world. The last day the Grand Prix cite was visited by users from 150 countries of the world. The uncompromising battle was going on up to the last day. The winner of the 4th round of the FIDE Grand Prix is Levon Aronyan from Armenia. The plastic card with the prize sum was presented to the winner by the FIDE Commercial Director Geoffrey Borg, the head of the KBR government Andrew Yarin and the minister of sport and tourism of KBR Aslan Afaunov. All the participants were presented memorable awards: Gata Kamsky for his “Will to victory“, Rustam Kasimdzhanov was called “Chess Ciceron”, Shakhriyar Mamedyarov became an “ All-round developed sportsmen”, “The prize of the viewers sympathies” went to Vassily Ivanchuk. See the pictorial album of the Closing ceremony . One more time we put the videos also on the homepage, so that nobody will miss the collection of best moments from the press conferences. The players explain in detail how the game went, where the mistakes were made and which were the crucial moments, all combined with diagrams. Enjoy! Levon Aronian became the winner of the fourth Grand Prix FIDE tournament which has come to the end in Nalchik. Having won in last round against Hungarian Peter Leko, the Armenian grandmaster has scored 8,5 points out of 13 and on one point has bypassed Leko and the compatriot Vladimir Akopian whom shared 2th and 3th 3 places with 7,5 points. After this tournament Aronian has moved on the third place in the general Grand Prix standings following Teimur Radzhabov and Alexander Grischuk and became one of the main applicants for a victory in the series. Final standings of the fourth Grand Prix FIDE tournament. "The most valuable victory is always in the future"